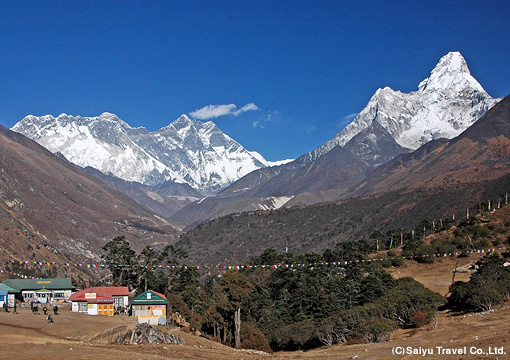 6night 7days Everest Tengboche trekking｜Saiyu Nepal Trekking & Expedition Pvt.Ltd. If you find this trip interesting, please send us an email or call our Offices. You can even visit our offices convenient to your location; please inform the date and time in advance. 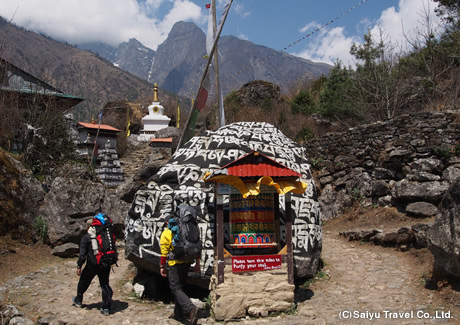 Start the day`s trek with a walk down to Phunki Tenga [3,190m]. 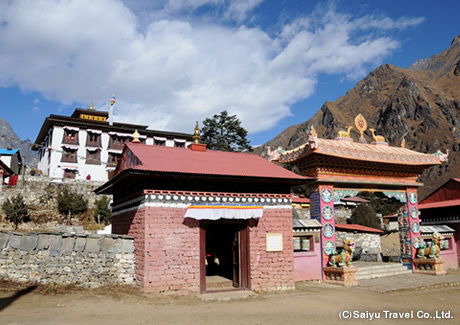 The second part of this trek is a steep slope taking you to Tengboche, which is located at the base of Amadablam and other beautiful mountains of Everest range can be seen. 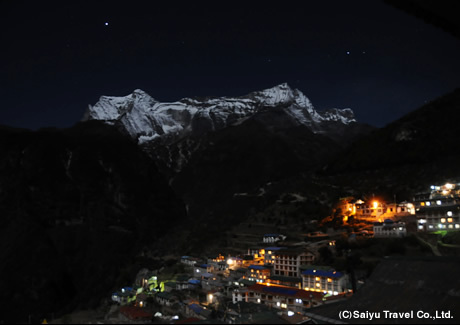 Overnight in Tengboche. If you desire, make a small excursion up to Tengboche Ri (4,198m), a small peak which offers a panorama view of the Khumbu mountains, before leaving Tengboche Village. After that, go down to Namche Bazaar. Kathmandu Fly back to Kathmandu with a domestic airplane. You will be dropped off to the specified place inside Kathmandu city. Note 1: For those who want to participate from the airport, an additional airport pickup charge will be applicable. ※If you are a group of 3 or more persons, please contact us for the quotation.Also, please donot hesitate to ask for the child quotation, if you are traveling with a child. ※The domestic airfares are subject to change without prior notifications. If it changes, a new tour cost will be applicable. Tengboche Ri is a hill top near Tengboche Village. After a walk of around 1 hour, you will reach to the top from where the Tengboche village looks small, while the mountains look much closer and giant. 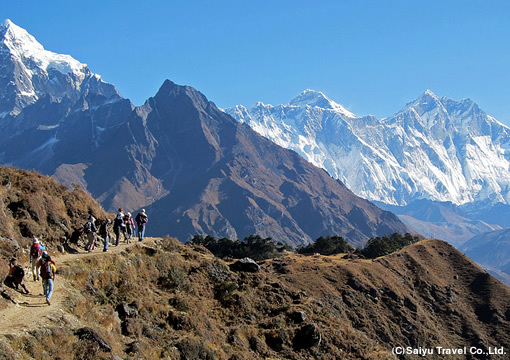 Mountain views from Tengboche are spectacular without any obstacles. The view widens from the top, Tibetan flags are fluttering around. Mt. Nuptse, Lhotse, Mt. Everest are the highlighted views seen from here alongwith the Kongde Ri on the background. Aren`t you interested in making a memory of mountains from Gokyo Ri. A glimpse of mountains seen from Tengboche Ri. 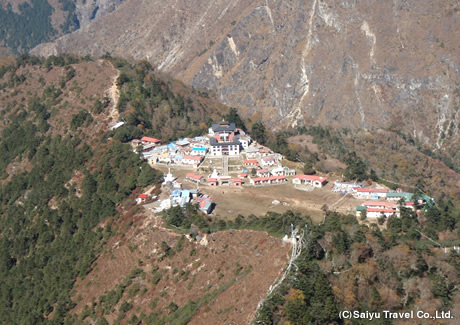 ●The Sherpa Village of Namche Bazaar and Everest View Point of Syangboche. 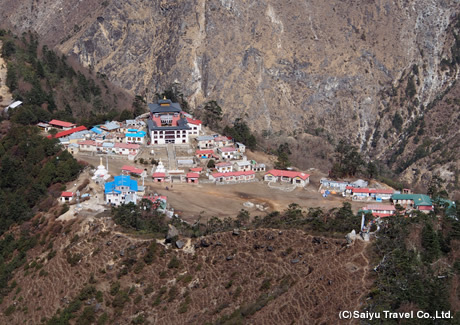 The Namche bazaar is one of trade centers of this region as well as the center of Everest region trekking. Located at 3,440m above the sea level, you can explore the traditional lifestyle of the Sherpas people. A hub of trekkers, it is generally filled with tourists from all over the world. Syangboche hill, at an altitude of 3800m above the sea level is located a little closer to Everest, and offers great mountain views of Mt. Everest, Lhotse, Ama Dablam, Thamserku etc. 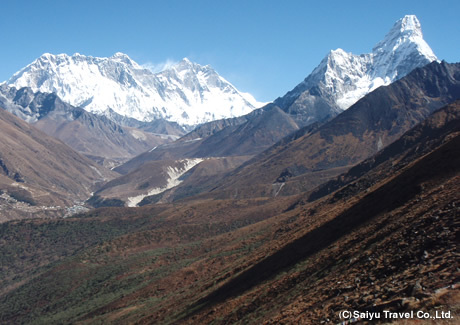 This trek is also recommended for the trekkers who have limited time, yet want to see Everest with their naked eyes. Physical Strength A B C D It is 6 days trek with 3 to 8 hours trekking on each day. If you have experiences of trekking in the mountains, this may be suitable for you. The height difference on day02 and day04 is more than 600m. Exercises, jogging are recommended to get fit for this trek. Altitude A B C D The highest altitude you will reach during the trek if 4,198m [Tengboche Ri]. 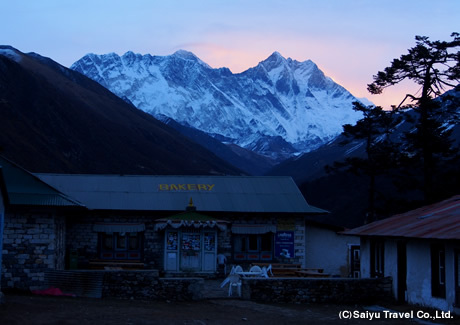 The highest altitude of accommodation is 3,867m at [Tengboche]. High altitude sickness symptoms may appear on the way. Proper drinks, health management is highly recommended. If you are not confident about your physical fitness, please consult with one of our travel specialists about your trek options.